Writing dialogue: Who said what? Mary, Jack, and Andy sat on a bench. “What time is it?” asked Mary. “Well, I do,” said Andy. Mary and Andy look at the watch on Jack’s wrist. I don’t know. I got lost after “I don’t know what time it is.” Maybe some readers could figure it out by going back and reading it a few times, but … no writer wants that. Attributes are simple little things that writers forget sometimes. We forget that readers cannot see inside our heads. Everything may be clear to us but not for the reader. Maybe you want to give the dialogue that rapid-fire feel, and you think the attributes slow things down. Truth is, they’re barely noticed. They’re little markers that keep the reader on track and the dialogue sorted out—kind of like the center line on a long highway. Can you leave an attribute off a sentence? Sure, but only if it’s obvious who is speaking. Also, remember to give each speaker his or her own paragraph. To give your manuscript a polish, check out I Spy Edits. Comma splices—sad. How did that poor comma get there between two independent clauses? What kind of person expects that wispy curlicue to do the heavy lifting of a period or semicolon? Lucy is boring, she doesn’t know when to shut up. Ed is addicted to chocolate, he eats it all day. Walking outside is healthy, it relieves stress, too. Comma splices may be as rare as a Yeti sighting, but they’re out there. Believe me. There are also some people who don’t think it’s a big deal. It’s true. There are those who insist if the independent clauses are short and are closely connected, go ahead and use a comma. They say it’s no big whoop. I beg to differ. That’s how it starts, people. It’s a slippery slope. Can’t you see? Who decides what’s “short,” huh? Who decides what’s “closely connected”—some bleary-eyed writer at the keyboard with one, two, three too many martinis? That guy? Huh? If you are overwhelmed with the temptation to put a comma between two independent clauses, try using a semicolon. You’ll feel better, and so will I. If you think you may have commas in need of rescuing, visit I Spy Edits. Read any funny books lately? “How long is this dystopian ride going to last?” I asked. So, imaginary-futuristic-depressing gave way to contemporary-depressing in middle grade children’s books? Sigh. But depressing is not. Got it. Don’t get me wrong. I got into The Hunger Games as much as anyone. And I know readers—teenagers especially—feed off any devastating and gripping rollercoaster of a read. But do people want to read that all the time? I like humor. Unfortunately, I don’t see enough of it on the bookshelves—for middle grade, young adults, and beyond. Remember when Oprah had her TV book club? I would look for that little Oprah seal on a paperback and buy it. However, I bailed out early. My God, no wonder suburban housewives drink. Isn’t real life rocky enough without a constant consumption of depressing books? Not much has changed since my conversation with the agent more than a year ago or even when Oprah first started her book club way back when. Are writers sad and angsty and tragic in general? Or is all that stuff just natural to write about? I know I might be alone out here in La-La-Happy-Land, but … come on! Where’s your sense of humor, publishers? Writers? Help a reader out. Do you know the difference between the words stationary and stationery? When I edited articles for a parenting magazine, we got a charming piece about thank-you notes and how kids can create their own stationery. Charming. Except the writer kept using the word stationary, meaning not moving. Apparently, she didn’t catch the difference between stationary and stationery—and neither did her spell-check. Did she arrive in the nick of time or the knick of time? He got his just deserts or his just desserts? I waited with bated breath or baited breath? The tortoise had free rein of the house or free reign of the house? Did he wreak havoc or reek havoc? So, let’s be careful out there. Give your words a double take. I interrupt your regularly scheduled program to bring you this editing reminder: Stop writing it’s when you should be writing its. It’s is a contraction for it is or it has. Forever and ever. Amen. So, you would write: The scruffy dog scratched at its fur. No apostrophe. An ’s would mean: The scruffy dog scratched at it is fur. Makes no sense. Get it? Good. Write on. 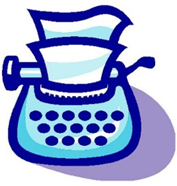 Visit I Spy Edits for copy editing services. Weird, huh? I know it’s a kooky hang-up. The only time I should get strange about the use of a semicolon is when it’s misused or abused. Commas are used to set off a series of items or phrases in a sentence. But when those items or phrases include commas, you need to use a semicolon for clarity. I have lived in Goolagong, Utah; Howsit, Texas; and Upyonder, Montana. The man was an intense, meticulous, and obsessive house cleaner; a tireless, hardworking, and loyal employee; and an all-around nice guy. Semicolons are used to join two independent clauses that are closely connected. Jewelry makes a nice gift; power tools are better. Chocolate is not a dessert; it’s a major food group. I couldn’t look at her; she cracked me up. The young man was brilliant; however, he was difficult and unreliable. They all showed up to my party; furthermore, they brought gifts. I admit I have been tempted to box away a period or two and try on a semicolon—just to see how I look in it. But it seems so Dom Pérignon and caviar. I’m a beer-and-pretzel kind of writer, after all. I don’t mean Stella Artois, either. I mean the whatever’s-cheapest-and-on-tap kind. So, yeah. I’m sticking with the tried and true, plain, old period. I’ll leave that fancy period-in-a-dress to the more erudite and sophisticated writers. Many have the notion that writing is this airy fairy, artsy fartsy pursuit. Creativity can only come if you’re feeling inspired. You need that spark that unleashes your imagination. You need that idea to pop up and grab you. You need your muse to lift you to that lofty realm of creative consciousness. You need your coffee. Baloney. Well, maybe you need your coffee. But you can’t wait for that warm, fuzzy writing feeling to overwhelm you. Sometimes it doesn’t happen—for a long time. Maybe you don’t know what to write about it, but you can decide now who you want to write for: children’s magazines, a hobby magazine, a contest, or a traditional book publisher. Take a gander at the library and bookstore shelves. Jot down ideas. Go to book or magazine publishers’ websites. Find their writers guidelines and see what they want. It’s up to you to decide how much time you can or need to devote to your writing. But devote, you must—even if it is one evening a week, or two hours on Sunday, or 20 minutes a day. Schedule the time in your calendar. Fill your calendar with deadlines: The third week of next month, I will have my children’s story finished and ready to submit. Three months from today, I will have the first three chapters of my novel written. Make a chore chart, if you need to: start outline on YA novel, edit nature article, rewrite ending of short fiction story. Check off each goal and add to the chart. Also, make a chart to keep track of submissions to magazines, publishers, and agents. Include date of submission, response (if ever) date, published or no, payment info. Get up, get dressed, and drive or walk yourself to your writing job—at a coffee shop, the library, at a picnic table in the park. This was my problem. I had only the vaguest idea for a story, and I couldn’t move forward. So, I found a local coffee shop filled with people tapping away on their laptops. It worked. I couldn’t just sit there and stare into space—I had to do something. I started writing on the topic and didn’t stop until I had a story. Plan to meet often and promise to keep chatting to a minimum. Set the timer on your phone to sit and write and nothing else. Classes, workshops, seminars, retreats—they all have something in common: They force you to write. When I needed to exercise, but wasn’t making time to do it, I signed up for a class. Paying for the time motivated me to attend. Who wants to waste money? Once or twice a month, pages are due—online or in person. My writers group gives me plenty to write about each month—or should I say rewrite? Besides the critique group, I meet with a writing partner once a month. We share what we’ve written, what we’ve submitted, talk about writing goals, and give a few words of encouragement. Sometimes writing seems easy—the idea’s there, the words are flowing, the page on the screen is filling up. But sometimes, it’s not. Write anyway. Write anything. Pick someone at that coffee shop. Write a description. Imagine a personality, a life. Write. It doesn’t matter if it’s good. It doesn’t matter if you’ll ever use it. It will get you writing. And maybe that’s the simple goal you need right now. Writers: What’s your favorite word? I bet I could guess your favorite word. I’m not psychic, but if you’re like many writers, I could figure it out. When I combed through my first manuscript looking for my most-used word, it became clear after just a few pages. And there it is. Did you see that cute hunky nugget? Just. Oh just, how do I love thee? Let me count the times I write thy name. If just were a man, I’d cook him dinner, text him 20 times a day, stalk him, stand outside his apartment, and beg him to let me have his baby. That’s how many times I write just in my stories. I read a novel—the first in a series—by a writer who had her work turned into a cable movie series. The story was intriguing, but this word kept popping up: sardonically. After one, two, three times, I didn’t pay much attention. But then it kept jumping up and poking me in the eye. Halfway through the book, I yelled “For the love of God, get a thesaurus!” Or delete a few. Or rewrite to show, not tell. But I kept reading. It was an interesting story … and the author is a bajillionaire, after all. And I am, well, not. Maybe you don’t care if you use the same word over and over. Maybe you have such a compelling story, you think it doesn’t matter. But I implore you, if you have any compassion at all, or feel any kinship with readers, for the love of all things biblio- and bookish, please get a thesaurus. Or take your favorite word and get a room. Does Your Story Need a Trim? Yes, yes it does. We writers love the words we produce—a little too much. Sometimes our descriptions go on way too long. Scenes and dialogues may be well written, but sometimes they don’t have any relevance to the plot. Everything you write should move the story forward. Maybe you think your long description with its luscious words will impress the reader. But maybe all it does is slow down the action. Put your manuscript away. Pull it out one, two, or maybe four weeks later. Are there any parts you gloss over to get to the next piece of action? Are there any paragraphs you read twice because when you get to the end, you have no idea what the point is? Do you notice long paragraphs that turn out to be one long, for-the-love-of-god-please-end-now-before-I-pass-out sentence? Do any descriptions or metaphors seem a little forced? Confusing? Weird? The list goes on. Many of us use particular words while writing because that’s how we talk, but if you can take these words out of your sentences without losing the meaning, kiss ’em goodbye. I love to slice and dice words, sentences, paragraphs, even whole chapters. To me, it’s like losing weight without having to diet or exercise. I do feel lighter. But I know not everyone feels that way. Ever see those makeover shows on TV? Sometimes a woman will weep as the hairdresser snips away at her monstrous mane. Editing your precious words may seem like that. But like hair, words can grow back. Track your changes in Word or save a copy of the original. Chances are, you’ll fall in love with the tighter, sharper version of your story, and you’ll never look back. For a closer look at your manuscript, visit I Spy Edits. Ease up on -ly adverbs. Seriously. When I first sought out tips as a newbie writer, number six on someone’s Ten Rules of Writing list hit me: Never use the word suddenly. Never. That rule hung there like one of those do-not-remove tags on mattresses. I’ve broken the speed limits, told little white lies, and committed any number of venial sins without pause. But I have never removed the tag from the mattress, and I never use the word suddenly in my writing. Never. Before you break into a panic remembering all the times you wrote the word suddenly, you should know that frequent use of the word suddenly has not been proven to cause cancer. Side effects such as headaches, nausea, frequent bowel movements and the inability to control them have also not been proven. However, there might be some editors who disagree. Removing the word could result in better writing. Try it. So, what about other -ly words? Do you often use an -ly adverb to modify said? “Stop.” Sam shook his head at her and then walked away. “Stop.” Sam raised his fist, ready to strike. Show, don’t tell. Those -ly adverbs don’t show, and they don’t tell me much either. Take a highlighter and mark all the -ly adverbs in your manuscript. Then go back and ask yourself, can I write it a better way? I think you can, and I know you’ll see a more active story.